Last weekend, my husband and I went out of town for a little fall getaway and spent a long weekend in the Adirondacks of Upstate New York. With all of the (exciting!) things that have been going on in the way of travel, presentations, cooking demos, and workshops, I was in need of a break, and Bill and I were overdue for some time to reconnect and relax. It was SO beautiful, and fall was in full swing. 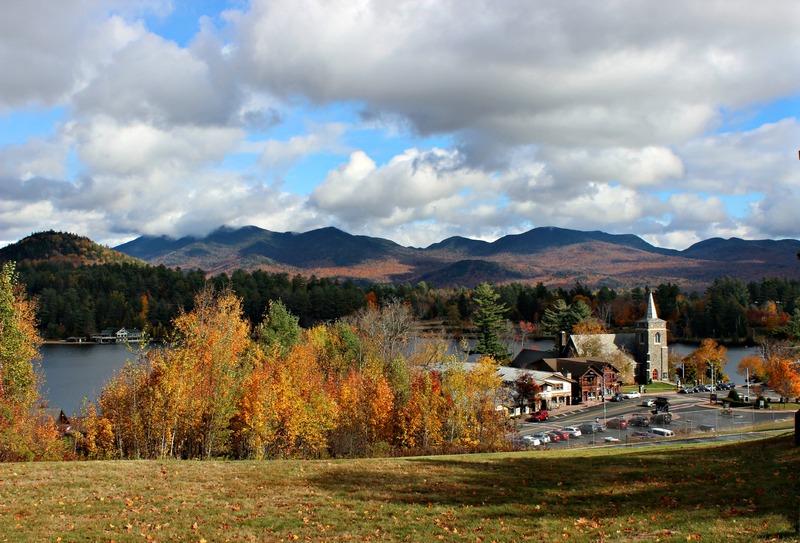 We captured this beautiful view of the town of Lake Placid, overlooking Mirror Lake. This is my favorite time of the year for those reasons and because I absolutely love fall food. Roasted root vegetables. Creamy squash soups. Savory stews. Hearty chilis. Heart and soul-warming cups of tea and bowls of oatmeal. And with Thanksgiving coming up next month, things like turkey, stuffing, roasted Brussels sprouts and pumpkin everything will start to take center stage. 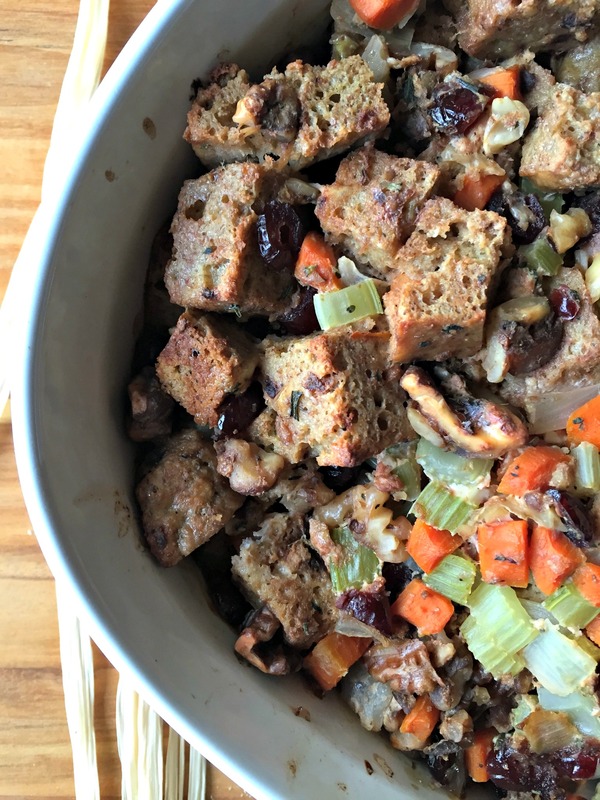 But, in the meantime, we’re going to focus on one of the top-rated meals I served at the class that everyone loved…Paleo Bread Stuffing! 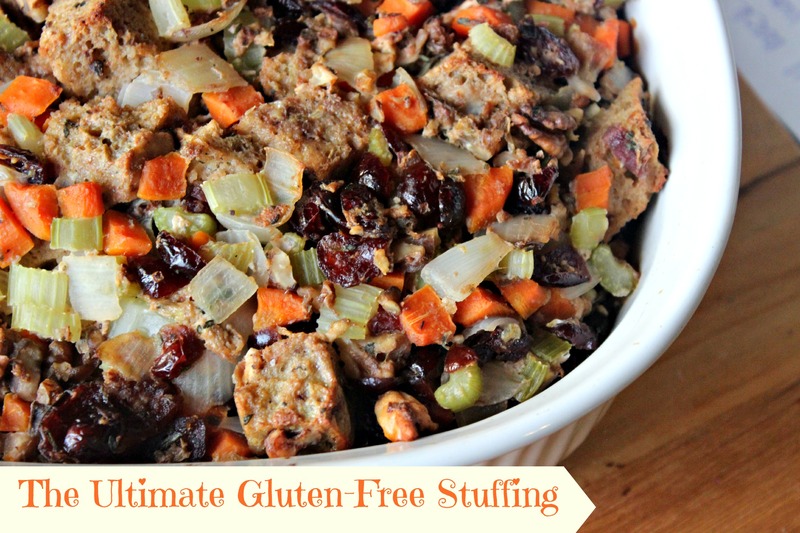 That stuffing recipe is officially my new go-to. I’m confident I’ll blow away my 3 sisters-in-law this Thanksgiving, which isn’t easy to do. If you’re ready to wow some of your family members this year, look no further than this recipe. 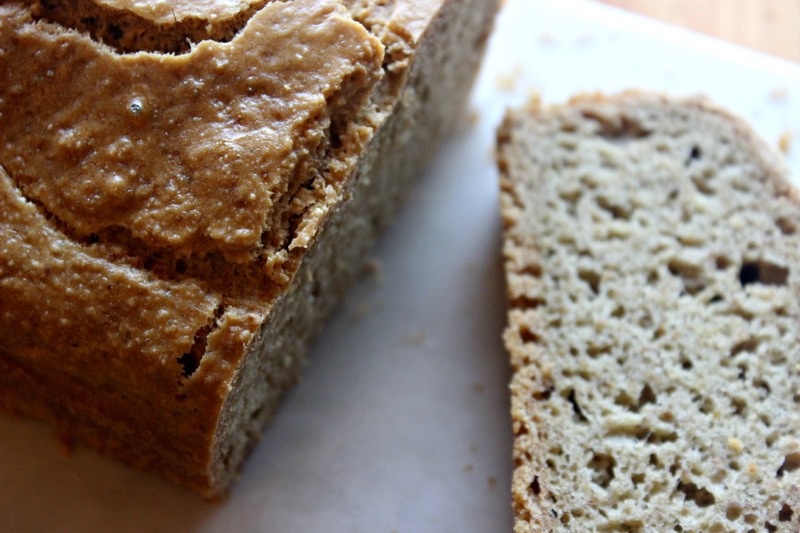 Most gluten-free bread is full of LOTS of other ingredients (they have to put something in if they take out the key ingredient in bread…gluten) and tends to have less fiber than its gluten-containing counterparts. Because of that, I’m not a huge fan of eating bread just because it’s gluten-free. It’s naturally gluten-free and only has 6 SIMPLE, REAL FOOD ingredients. The bread mix is from a company I met at the Natural Products Expo – Simple Mills – and all you need to make it is oil, apple cider vinegar and eggs! Here’s the recipe! You are going to LOVE it. 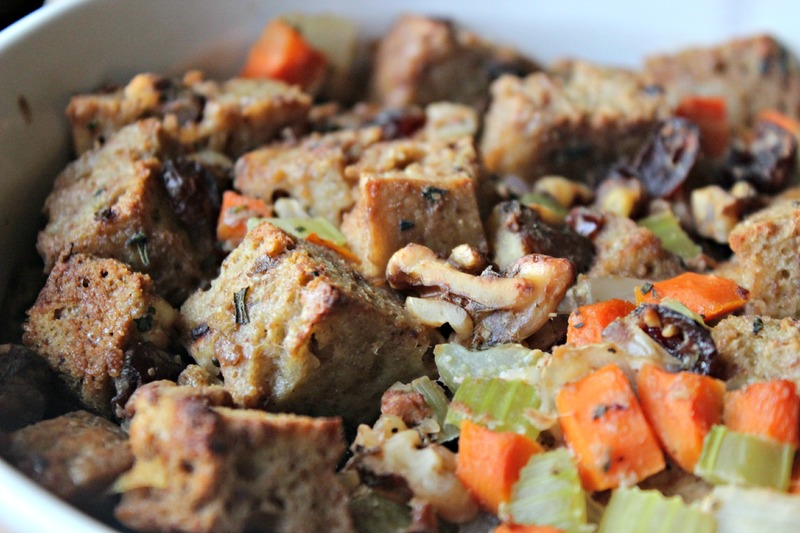 For a healthier spin on this year's stuffing, try this recipe! Cut the loaf bread into cubes; toast the cubes in the preheated oven about 10 minutes to draw out the moisture. Add walnuts and toast another 8 minutes. Remove from oven and set aside. While the bread cubes are toasting in the oven, heat a large saucepan or Dutch oven over medium heat and sauté celery, carrots, and onion in ghee for 5-8 minutes or until the vegetables have developed some color and are tender. Raise oven temperature to 400F. Add toasted bread, herbs, walnuts and cranberries to pan and toss to combine. Remove pan from heat. Whisk eggs together and pour on top of bread mixture, tossing to coat evenly. Then, pour on the broth and toss to combine. Pour veggie/bread mix into a baking dish and bake for 30 minutes, covered. Remove lid/cover and bake uncovered for 10 more minutes to crisp up the top. 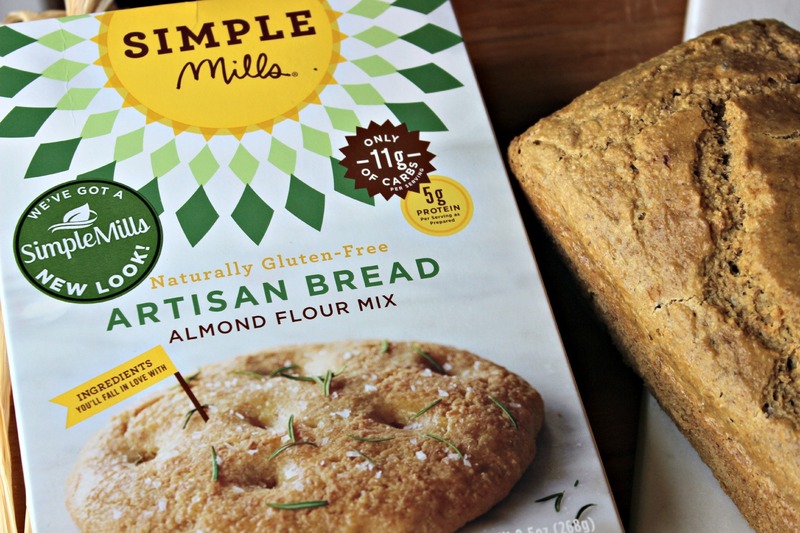 You can find Simple Mills products on Amazon, at Target, MOMs Organic Market, Wegmans, and Whole Foods. Think this bread would work in a moist dressing? That’s what I grew up with and miss most. The ingredients were butter, seasoned bread cubes,cooked mushrooms, celery, onions, and carrots, cooked giblets, broth to moisten (it would be pretty “wet”) all put into a baking dish with butter (ghee, now) on top and baked up. I’m just wondering if the bread would turn to mush in something like that? Thank you for your great products. Good question! I’m not 100% sure since I haven’t used it in a moist dressing, but I would bet the trick is cutting up the bread small enough so that when it soaks up the liquid you mix it with that it gets moist. I would use smaller chunks than what I used in this recipe. If you do it, let me know if it works!